I am going on my very first all inclusive vacation at a resort in Cancun this summer and I can’t wait! I plan to relax and soak up some vitamin D all week! However, I want to protect my skin and will definitely need to bring my Blue Lizard® Australian Sunscreen. 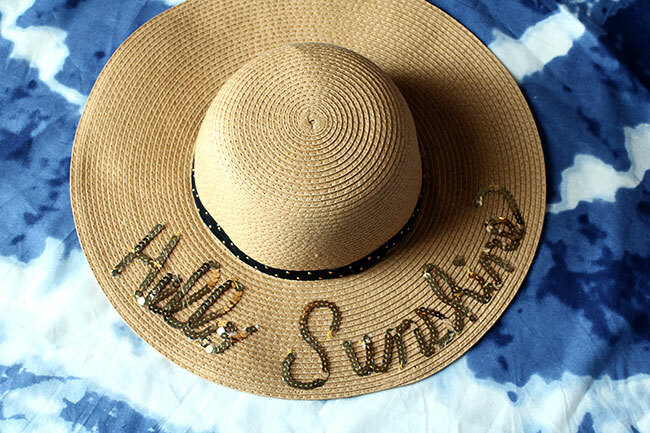 Today I’m sharing a DIY on how to personalize a sun hat with sequin letters that say ‘Hello Sunshine!’. 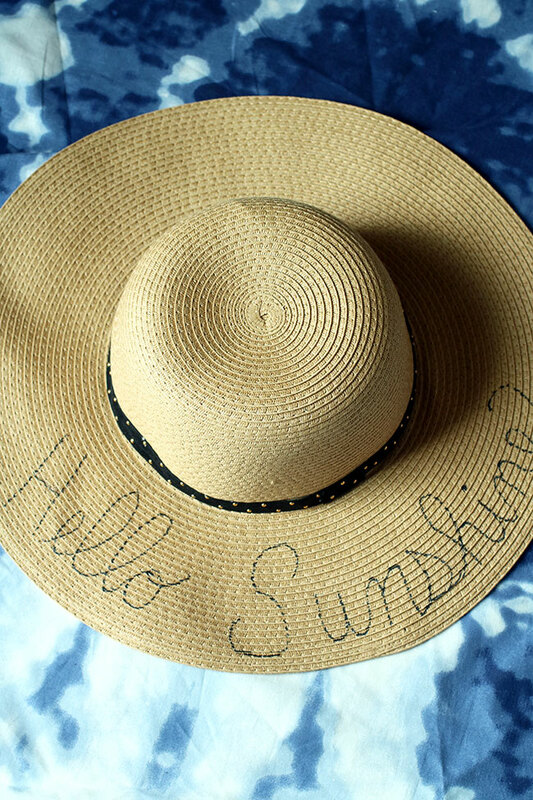 I plan to wear this hat while on vacation as an extra preventative measure to protect the skin on my face! There is a lot to do at the resort and while we’re walking around and doing different excursions, I want to stay protected by a brand that I can trust! 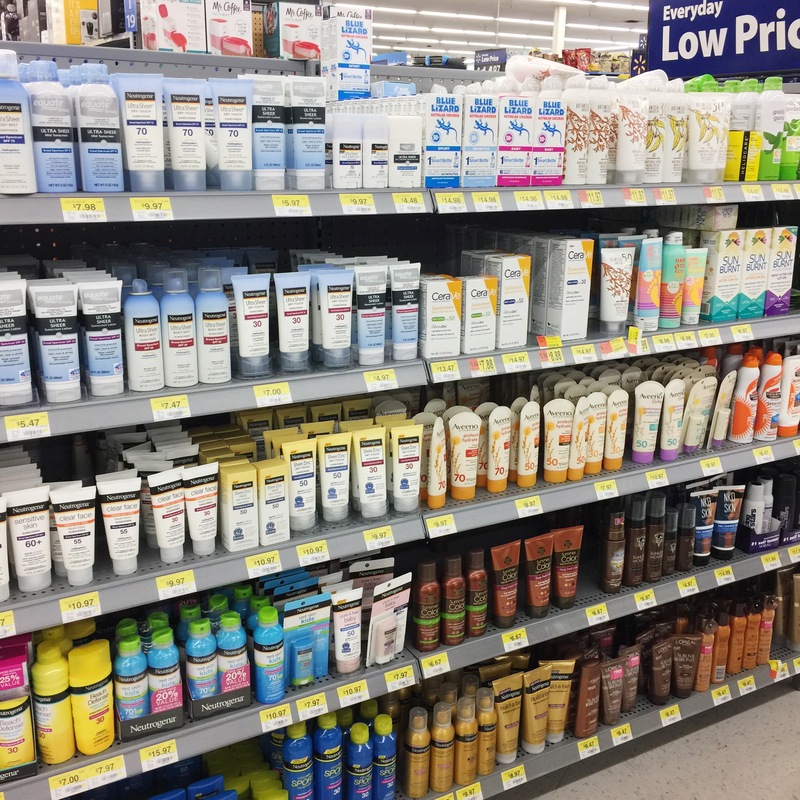 When browsing the sunscreen aisle, you may feel overwhelmed. 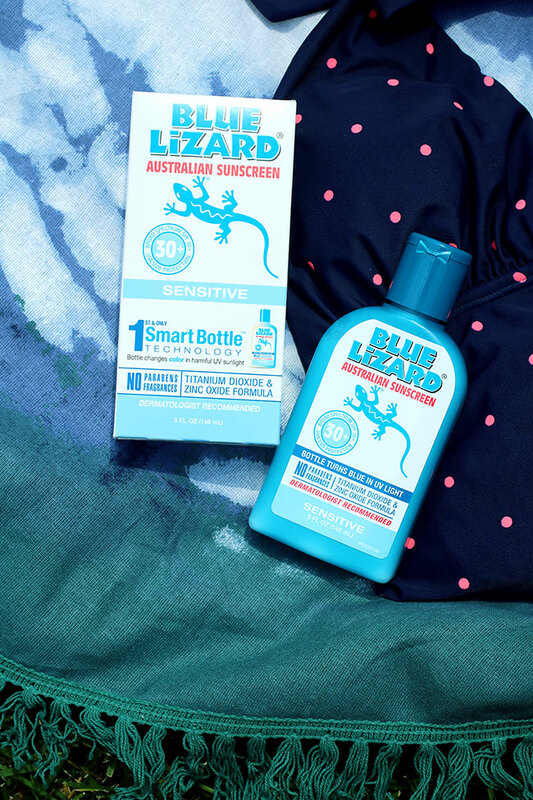 What I love about Blue Lizard® is that it has Patented Smart Bottle™ technology, the bottle changes color when exposed to harmful UV sunlight. You’ll see in the photo above it has changed from white to blue! This serves as a great reminder to re-apply sunscreen! This sunscreen was originally created in Australia, where sunscreen standards are the strictest in the world. My family (ESPECIALLY my kids!) has sensitive skin. 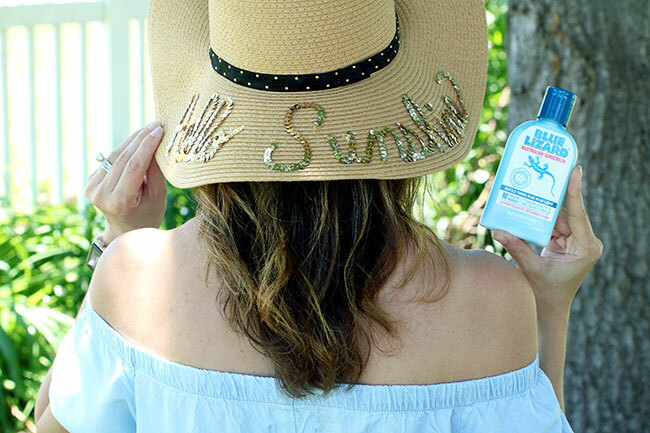 This sunscreen has been dermatologist recommended for over 15 years and is even trusted by pediatricians! This is important to me as a mom and it is just easier to buy one sunscreen that works for all of us as a family! Blue Lizard® provides all the coverage to keep my family safe. 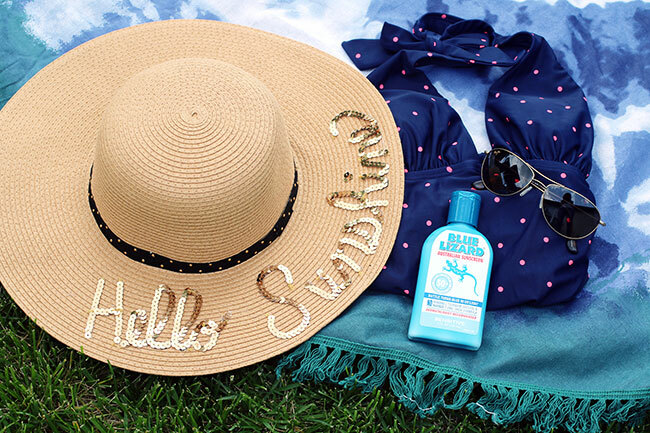 Their products have a unique zinc oxide formulation and provide broad spectrum UVA/UVB protection (SPF30+). 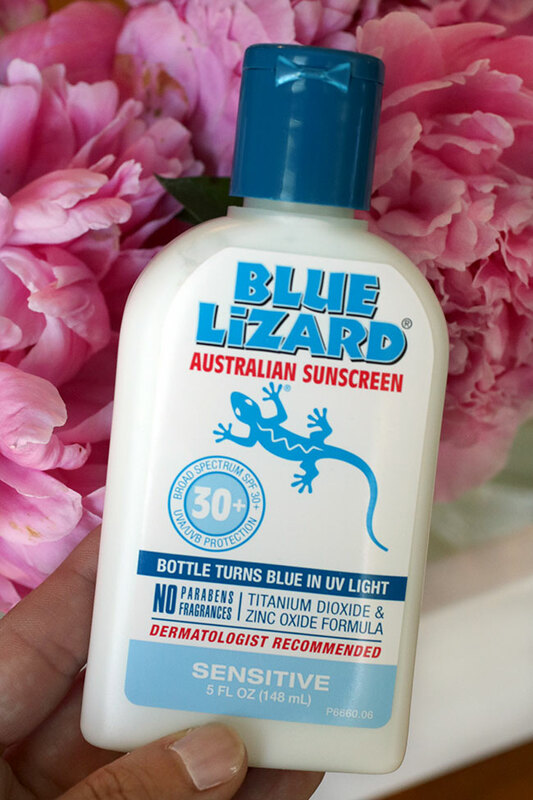 I am picky about what brand of sunscreen I use for my family and decided that Blue Lizard® Australian Sunscreen Sensitive in 5 oz. would be best for us! I found this sunscreen at Walmart in their sunscreen island near the front of the store. There is also an iBotta offer at Walmart right now! 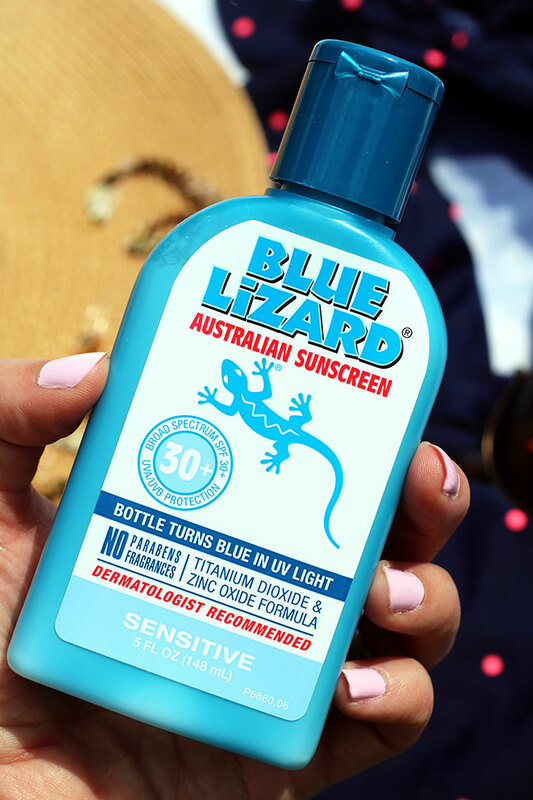 Join iBotta and earn $4.00 when you purchase Blue Lizard® Australian Sunscreen (baby or sensitive based on round), 5 oz. bottle only. Click HERE to save now! 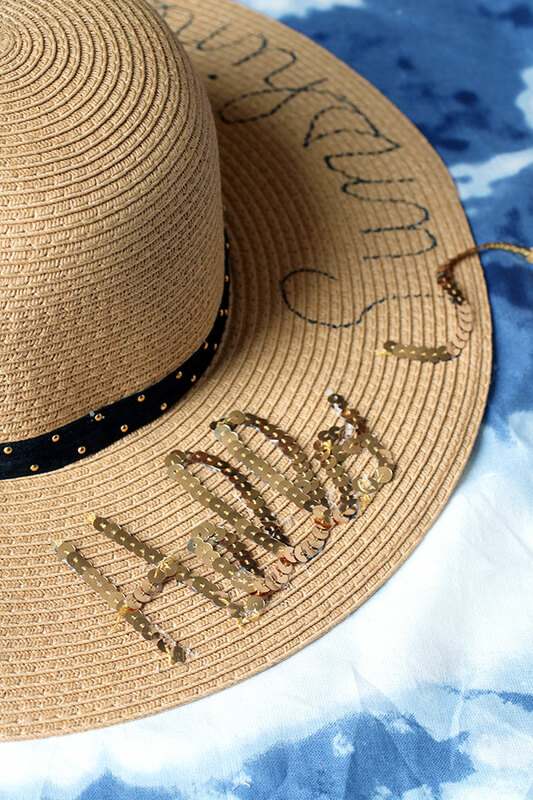 Now I’ll share with you an easy DIY for a sequin sun hat! 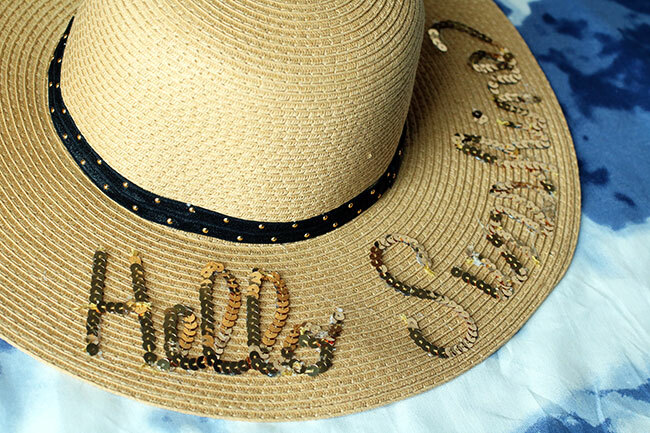 I found the hat at Walmart (they had a lot of different styles and colors to choose from) and I was able to personalize it with the saying I wanted with a sequin strand! 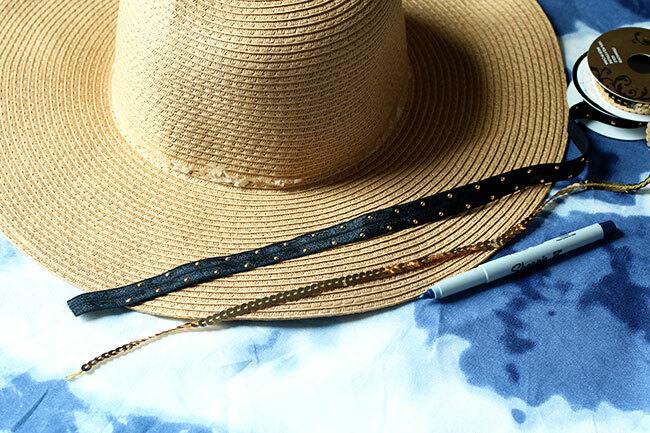 For this project, you’ll need some ribbon to put around the top of the hat. I used a black with gold polka dot patterned ribbon. A pom pom ribbon would be fun, too! 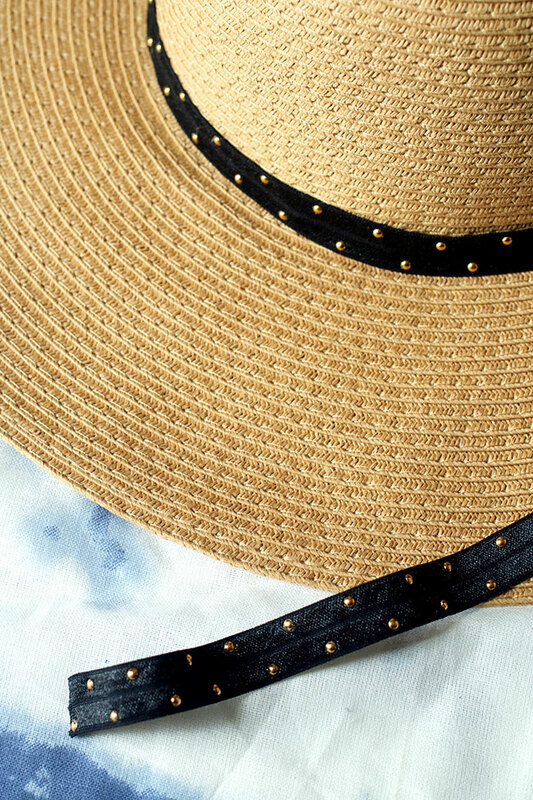 You’ll also need one roll of a sequin strand, a hat, hot glue gun and marker. If the hat has something around the top rim, you should be able to remove it. The hat I bought had a gold chain around it and it was secured by hot glue, so I was able to easily remove it. Adhere your ribbon around the top rim. Then, with your sharpie write out your message. Make sure you write big! I suggest practicing on a sheet of paper first. Hot glue the sequin strand over the letters you drew. This is what your hat will look like when you’re done! The hot glue should dry quickly and you’ll just want to brush off any hot glue stands before wearing. 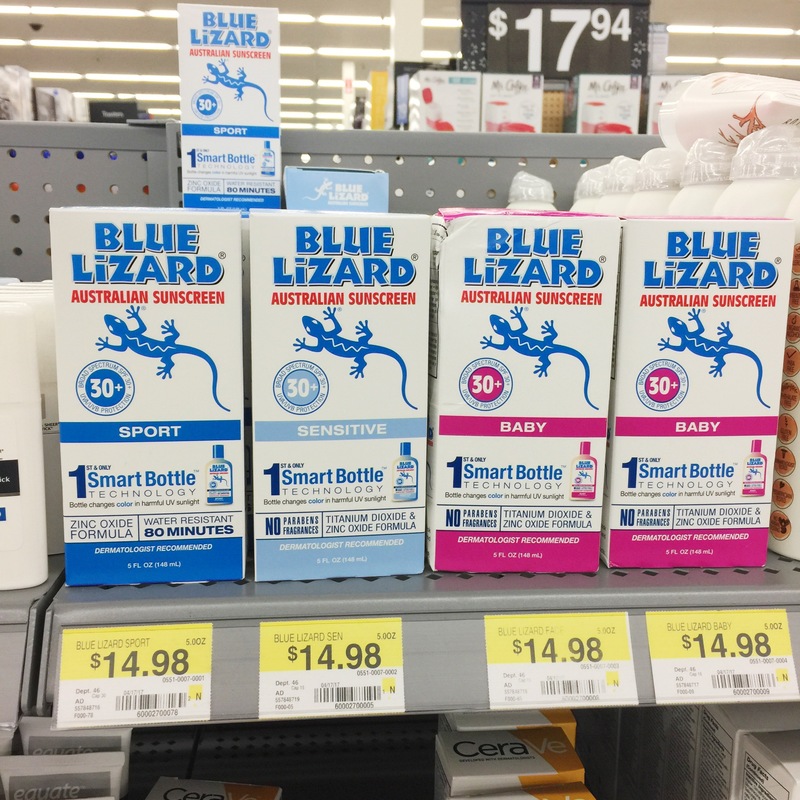 Blue Lizard® is a brand trusted by dermatologists, pediatricians, and especially moms! The sensitive variety that I am using is paraben-free, chemical-free AND fragrance-free! I’m also thinking about picking up a bottle of their Sport variety, which is extremely water resistant. This formula meets Australian standards of staying on 240 minutes of whirlpool water. Be sure to check out Blue Lizard® HERE and don’t forget about the iBotta offer! Do you have any fun summer outdoor activities or vacations planned? How do you plan to protect your skin for them?